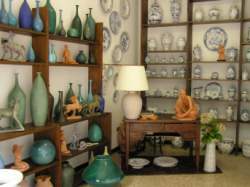 In her workshop, active since 1977, Brunella Ratto moulds clay into statues and bas-reliefs, but also into pots and original accessories for artistic inside decoration. The unique pieces, designed and entirely hand-made by Brunella Ratto using fireclay as raw material, will decorate and bautify front of buildings (for instance the front of the Town Hall of Cogoleto), gardens, fountains, main doors, fireplaces and also chapels. Many items treat religious subjects. It is very intresting the manufacture of cribs, which are made with a very personal interpretation of the typical Ligurian tradition. Brunella Ratto took also part to many exhibitions in the most important italian and abroad towns among which Genoa, Milan, Florence and Frankfurt. The video, shot by A.C.C.O. - Associazione Culturale Cogoleto Otto during the "Weeks of culture 2011", shows the making of some pieces; all the stages, from modeling to painting, are entirely hand-made.